Have you ever played with magnets? You might have done an experiment where you lay a magnet onto a table and place an iron nail nearby. If you push the magnet slowly toward the nail, there will come a point when the nail jumps across and sticks to the magnet. That's because magnets have something invisible that extends all around them, called a 'magnetic field'. It can cause a pushing or pulling force on other objects, even if the magnet isn't actually touching them. Astronomers think magnetars may be created when some massive stars die in a supernova explosion. 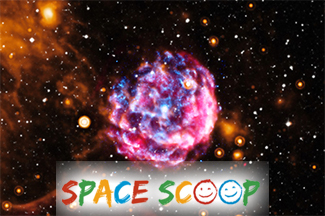 The star's gases blow out into space creating a colourful cloud like the one in this picture, called Kes 73. At the same time, the core of the star squashes down to form a magentar. 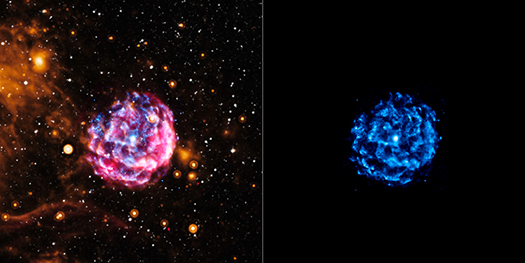 At the centrer of the cosmic cloud in this photograph lies a tiny magnetar. But what this star lacks in size it makes up for in energy, shooting out powerful (http://www.unawe.org/kids/unawe1381/) jets of X-rays every few seconds! You can see the X-ray jets in blue on this photograph. Cool Fact: Astronomers believe there could currently be more than 30 million magnetars dotted across the Milky Way!